Joachim Ruhstein's youth in the outdoors of Lower Bavaria in Germany instilled in him a love of nature. He has had a lifelong passion for fishing, and on his many fishing trips he developed an interest in the wildlife around him. Over time, he developed his knowledge of the animals' habits and of wildlife photography; and he also eventually became interested in film. He spent many hours photographing and filming wildife, persevering despite adverse weather conditions and long waits for animals to make their appearance. 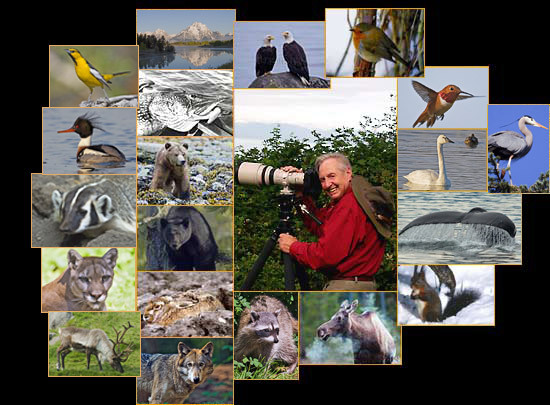 Mr. Ruhstein has produced a considerable collection of wildlife and nature photographs as well as several internationally-recognized, award-winning nature films. On his retirement, Mr. Ruhstein moved with his family to the Comox Valley on Vancouver Island, BC, Canada, where he could continue his adventures in sportfishing and wildlife photography. To find more about Joachim Ruhstein, his photography and his films, please visit the About Me section. This website showcases some of Joachim Ruhstein's favorite wildlife, fishing and nature photographs taken over the years in Canada as well as in his native Europe. The Online Wildlife Photography Gallery groups hundreds of wildlife and nature images into logical sections. Many of the individual photographs include information about the species, fishing trip or landscape depicted. These photographs are presented here for your enjoyment. You may want to check back regularly, as Mr. Ruhstein adds new photographs often to this online collection.